Our 5 Night 5* Private Irish Castle & Manor Vacation is luxury travel at its finest. 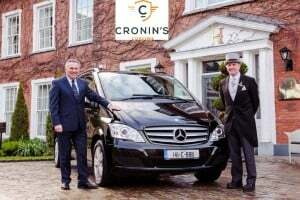 From the time you arrive in Ireland, you will be whisked off on your own private chauffeur driven tour. Ireland is a country of enchanting landscapes & unrivalled scenery – all of which you will view while touring daily from the comfort of a luxury vehicle & the service of your private driver/guide. You will stay in Ireland’s finest castle, Ashford Castle, & the historic Hayfield Manor in Cork, living like modern royalty during your stay. Ireland at a Glimpse Discount Card – Save up to €500 Euro with Discount Pass & access to 76 of Ireland’s Premier Attractions such as the House of Waterford, Titanic’s Dock, Bunratty Castle & much more! Depart Shannon Airport travelling east to Cashel in Co. Tipperary. Cashel is a thriving market town set against a backdrop of antiquity and situated in the rich pasturelands of the Golden Vale. Its most famous characteristic is the “Rock” of Cashel”. This “lump” of limestone is 200 feet high and is said to hail from the Slieve Bloom Mountains thirty miles to the north. Legend has it that the devil took a bite out of these mountains and, finding that it did not agree with him, spat it out. It landed at Cashel. The gap left by the “bite”, known as the Devil’s Bit, can be clearly seen from the top of the rock. This place was in the forefront of Irish ecclesiastical and political history for a thousand years before a long period of neglect set in during the 18th Century. In addition to the Rock itself, the city of Kings has many varied attractions including The Folk Village, Bolton Library, Kings Heritage Centre and Hoar Abbey. Continue your journey south to Cork City. Check into Hayfield Manor, Cork where you will spend the next 3 nights. Cork or Corcaigh or ‘The Great Marsh of Munster’, which had its historic beginning in the 7th century when St. Finbarr founded his monastic settlement on what is now Gillabbey Rock. The physical shape of Cork derives from its island beginnings. Water and tides, birds and boys fishing, bridges and Amsterdam-like house-fronts, all cajole the walker and casual visitor to the city. Up to the 1770s Cork was a city of waterways. Patrick Street was seriously damaged in the dying days of the War of Independence but much of the remaining fabric of the city remains as it was in the 19th Century. Cork has many physical qualities, steps, steeples and hidden squares and lanes. Over the years the medieval plot size and street pattern have been retained, despite much of the city being rebuilt in the 18th and 19th Centuries. After breakfast you can travel to the other side of Cork Harbour and visit Cobh (pronounced Cove). The Great Island on which the town of Cobh stands is the largest island in Cork Harbor. The island has a history which dates back to pre-Christian times but the town itself is comparatively new, dating from the 17th century. Cobh’s varied history includes a reputation as a health and seaside resort. Famous for its colourful exteriors Cobh was the last port of call for the Titanic on its first and last voyage. It is also renowned as the main departure point for the many emigrants of the great famine of 1846 – 1848 whose story is told in The Queenstown Story Heritage Centre Follow the Titanic Trail or visit the memorial to victims of the Lusitania, which sank off the coast nearby, to understand these important pieces of maritime history. In the afternoon travel to the nearby town of Midleton which is home to the Jameson Experience; Old Midleton Distillery. Set on 15 acres and beautifully restored, this is where the true heart of Irish whiskey beats. The old distillery is a unique experience with some of the buildings dating back to 1795. Take a journey through history and see the old kilns, mills and malting, water wheel and old warehouses. A short film sets the scene before their tour guide walks you through the old distillery. The guided tours last one hour and end with a complimentary glass of Jameson Whiskey and a chance to take part in a tutored whiskey tasting to become a certified Irish Whiskey Taster! Return to Cork City for overnight at Hayfield Manor. Following breakfast travel to the nearby village of Blarney where you can visit the famous Blarney Castle and the Blarney Stone, which has the traditional power of conferring eloquence on all who kiss it. The word ‘Blarney’ means pleasant talk, intended to deceive without offending. The battlements crowning the castle keep are typically Irish in form. Having climbed more than 100 steps, the famous Stone is set in the wall below the parapet, and to kiss it, one has to lean backwards from the parapet walk of the battlements. You can also visit the Blarney Woollen Mills for some fine quality Irish produce. In the afternoon travel to Kinsale. Every visitor to Kinsale is captivated by its beautiful setting, with the long waterfront, narrow winding streets and Compass Hill rising sharply behind the town. The old fortifications of Charles Fort and James Fort guard the narrow entrance to Kinsale from the sea. Not surprisingly the town is renowned for its fresh seafood and gourmet cooking, as well as the numerous ‘cozy’ pubs. The town has poignant memories of the sinking of the liner ‘Lusitania’ in 1915, off the Old Head of Kinsale, and it was in the courthouse the inquest into the incident took place. The picturesque village of Kinsale owes its unique character to the fact that it was a garrison town and very significant port. The influence of the Dutch traders is evident in the rows of coloured houses along the quays. Departing Cork City this morning you will travel through Counties Limerick and Clare before arriving at your final destination, Ashford Castle. 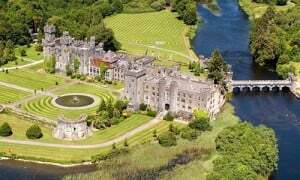 Continue onto Ashford Castle in Cong, Co. Mayo where you will spend the next two nights. Dating back to 1228 and once the estate of the Guinness family, the legendary 5-star Ashford Castle Hotel was one of the first luxury Castle Hotels in Ireland. Situated beside the tranquil Lough Corrib the setting for this world renowned hotel is truly breathtaking. Opening in 1939, Ashford Castle has welcomed many Heads of State as well as International Personalities over the years. The timeless classical interiors and award winning cuisine, combined with an array of Sporting Activities such as Fishing, Falconry, Golf, Horseback Riding and Cruising on the Corrib has resulted in Ashford Castle Hotel receiving many awards. Befitting the formal atmosphere of the George V Restaurant Ashford Castle kindly request that gentlemen wear a jacket and tie for dinner. Connemara, made famous by a number of well known movies – such as the John Wayne movie – “The Quiet Man”, and more recently “The Field”. Connemara is a wild and beautiful region of mountains, lakes, tumbling streams undulating bog, unspoilt beaches and panoramic views. It is a Gaelic speaking region. The centre of Connemara is composed of mountain peaks, the Twelve Bens or Pins, which culminate in Benbaun. Killary Fjord, located in Leenane, is Ireland’s only fjord. It forms a partial border between counties Galway and Mayo. It is 15 kilometres (9 miles) long and in the centre it is over 45 metres deep. From Nancy’s Point, just west of Leenane Village you can take a 90 minute cruise with Killary Fjord Boat Tours (operates April – October. Please check in advance for sailing times) on their all-weather purpose built vessel, the Connemara Lady. It allows uninterrupted views of the spectacular scenery which make Killary Fjord such a unique place. Setting off towards the west you cruise 45 minutes to the mouth of the Fjord, before turning to make your way back to Nancy’s Point. The cruise offers a great way to take in the dramatic sweep of the landscape, as you pass between the Twelve Bens and the Maam Turk mountains to the south, in County Galway; and the Mweelrea mountains to the north in County Mayo, as well as the views out to the Atlantic at the mouth of the fjord. The fjord’s sheltered waters are perfect for mussel farming and you will see the ropes at several points on the fjord. You will also see some circular salmon farms, closer to the shore. Sheep dot the hills. Towards the mouth of the fjord is a small island, which has a Victorian range marker on it. This is the point at which dolphins typically emerge if they are in the vicinity. They like to swim alongside the ship, offering spectacular views. Prebooking is strongly recommended. You should not miss the opportunity to visit Kylemore Abbey. Kylemore Abbey is the only home of the Benedictine nuns in Ireland. It was originally built by Mitchell Henry, M.P. for County Galway, (a native of Manchester city) 1864-1868 as a gift for his wife, who fell in love with the site overlooking Loch Na Coille Moire (the lake of the big wood) when they came here on their honeymoon in 1860s. The Gothic Church, set in the grounds of the Abbey, is the jewel in the crown of Kylemore. It has been lovingly restored and any visit would not be complete without seeing it. You can avail of the nun’s excellent home cooking for lunch if desired, or alternatively, bring a picnic and take your picnic on the shores of the loch. A private driver will drop you to Shannon Airport for your return flight to the USA.